Helping you to identify areas of improvement in your service and sales and your managers’ abilities to recruit and get the best out of their teams. The current state of the retail industry is extremely challenging with many concurrent activities increasing pressure on sales and margins. Here in Australia, we are seeing a number of large international retailers enter our market, the online and mobile channels are becoming a big part of everyday life for consumers which is forcing retailers to become experts at serving their customers no matter how the customer wants to shop. There is also increased competition coming from the big players in the Australian market who are rapidly expanding their offer into adjacent categories – supermarkets ever increasing the range of products such as insurance and hardware to name a few. All of the above is putting immense pressure on traditional bricks and mortar stores, relying on customers coming through the door. A number of these retailers are experiencing a decline in traffic counts. Along with all of this doom and gloom, there is a big challenge to recruit and retain the best talent. Research is even telling us that customer service levels are at an all-time low, nearly 60% of consumers believe that customer service has declined over the past 5 years. Furthermore over half of these consumers didn’t purchase as a result of poor customer service. At The Retail Solution, we believe retail service can be turned around and sales can grow providing a business has their focus in the right place. As retail experts, we work with clients to provide practical and custom solutions. Analysis of your current service offering. We spend time in your business reviewing your service offer and helping you fine tune this so it represents what both your company and your customers want. We believe if you deliver what your customer wants (and more), they are highly likely to return. 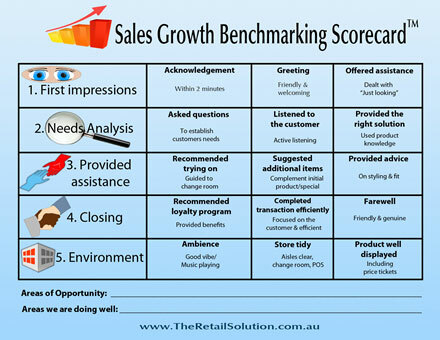 One of the tools we use is the Sales Growth Benchmarking Scorecard. We use this scorecard in your store and/or departments to evaluate exactly what your service levels are like. We then present this in a report to identify areas of improvement as well as letting you know the good things you are doing. This information is provided without any obligation to engage our services. As part of the customer service review, we also analyse your current sales processes and look at ways these can be improved. This might include focussing on particular products on the counter, improving team members sales techniques, analysis of ATV, IPD etc. To ensure any process and behaviour change is implemented and continues in store, it relies on the store manager’s ability to train their team and follow up. We review your current in-store coaching process to identify areas of improvement, therefore ensuring that any new training is locked in and followed up. Along with analysing your store manager’s coaching skills, we also review your Area manager’s skills in coaching their store managers. If your Area Managers have the ability to coach their store managers then accountability and improved performance are guaranteed. This is an essential part of providing great customer service and increasing sales – if you have the right team members this is so much easier. We spend time with you analysing your current recruitment processes and advise on areas that can be improved.